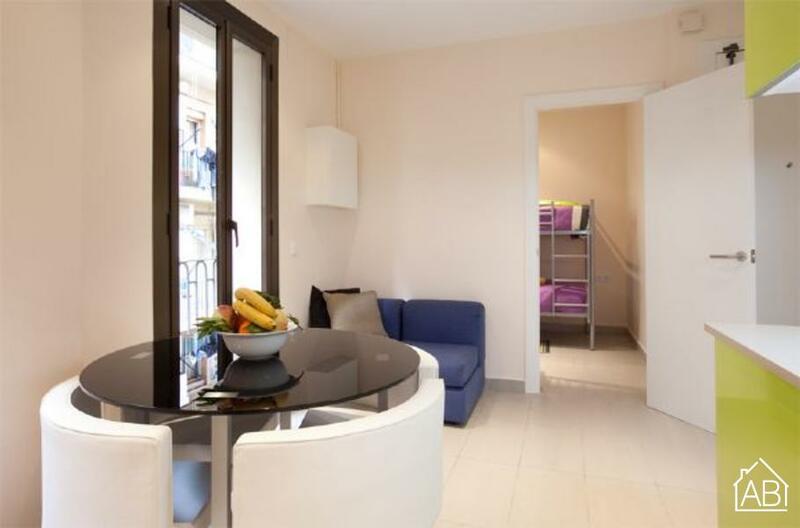 This is a cozy and modern, two bedroom Barcelona apartment, located just steps from the Barceloneta beach. Surrounded by many fantastic bars and restaurants, this apartment is ideal for anyone wishing to experience everything Barcelona has to offer, as you will find the city center just a short metro ride away. Decorated in a light and bright color scheme, this lovely apartment has a modish design and comfortable furnishings. The living room has a sofa, TV and access to the balcony through large patio doors, which also allow plenty of natural light into the room. The up-to-date American kitchen is fully equipped with all of the appliances and utensils you would need to prepare your home-cooked meals and there is a dining table where you can sit down to enjoy them. The bedrooms are both well-decorated and can sleep up to four people in total. One bedroom has two single beds while the other has a bunk bed (two single beds). The bathroom is well lit and has a walk-in shower.